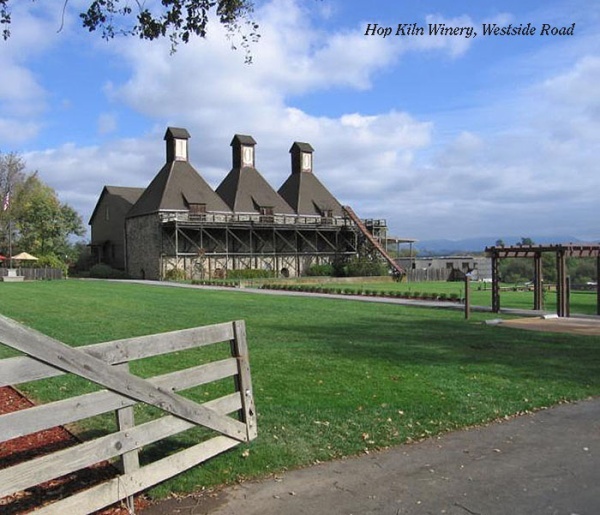 Our Ten Great Rides list offers two classic “Wine Country” loops. This is the slightly longer and more ambitious of the two. Whereas the shorter ride only explores Dry Creek and Alexander Valleys, this one samples both of those regions but also visits the areas covered by the Russian River Valley and Chalk Hill appellations. And while the short ride begins and ends in Healdsburg, this one stages out of a park on the southern edge of Windsor, quite a bit further south. Esposti Park sits near the suburban fringe along the southern edge of Windsor, just a mile east of the clutter of big box stores near the Hwy 101 off-ramps. We will have to pass through that clutter in the final mile of the ride, but for now, we’re heading the other direction: out into deeper country, beginning with Shiloh Road. At the end of a gently uphill grade on Shiloh, turn left on Faught Road. Faught rolls along the edge of the valley for a mile, with vineyards below the road on the left and wooded hills rising up on the right. Turn right on Chalk Hill Road and really head out into the country. This is one of the most popular cycling roads in the area, primarily because it acts as such a useful gateway from the Santa Rosa area out into the open landscape to the north. Chalk Hill climbs very gently—with numerous flat spots along the way—to a little summit, gaining about 400’ in three miles. Chalk Hill is one of the county’s many officially recognized wine appellations, and the pretty hills are often cloaked in the corduroy rows of vines. Not every acre is given over to grapes though. The road often winds through the dappled shade of oak, sycamore, laurel, and other broadleaf trees, and there are many horse ranches here as well. After the long, almost insignificant grade up to that little summit on Chalk Hill, we are rewarded with a more exciting descent than we have any right to expect...one of those rare cases where the downhill payback seems much greater than the uphill investment. It’s short but fun, as we toss away those 400’ of gain in less than a mile. After the descent, Chalk Hill meanders along, mile after mile, through some of the most pleasant country one could ever hope to find. There is nothing much in the way of big climbs or wild descents, but also almost nothing that is remotely flat...modest, lumpy rollers, again and again. Just past mile 10, Chalk Hill tees into Hwy 128. 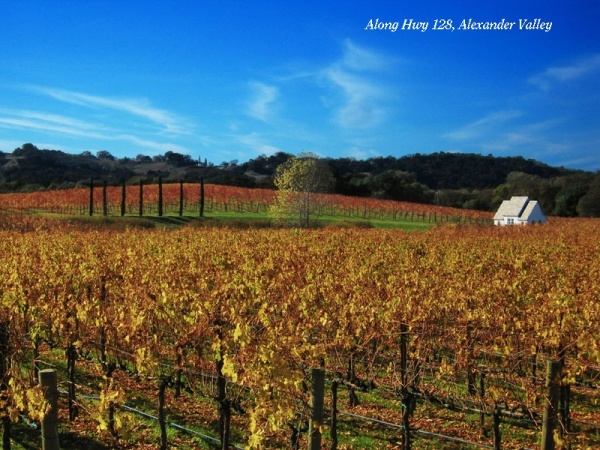 Our route goes left (north) on this smooth, rolling, lightly traveled highway and descends into Alexander Valley, one of the most prestigious wine regions in America. We’ll be riding north through this beautiful valley for several miles on a succession of roads. All these miles are as easy as any cycling miles can be: flat or gently rolling. Sometimes the road rolls down the middle of the nearly flat valley, with vines on either side of the road, and sometimes it rubs along the east side of the valley, with vines sprawling away on the left and oak-studded hills rising up steeply on the right. At around mile 13, Hwy 128 passes a road called Pine Flat. We are suggesting an out-&-back on this road as an optional add-on for those who want a few more miles, and especially for those who like a climbing challenge and the fun of a great descent. Pine Flat climbs 2000' in 7.5 miles, then levels out for a few miles and finally climbs another 1000' in a little over a mile, for a total of 12 miles...24 miles, round trip. This last pitch is brutal. It may be the steepest climb in the county, topping out at a leg-breaking 20% for long, painful stretches. Usually, when cyclists do this road, they stop at the 7.5-mile level, where there is a superb view over the valley. Pavement on this road, at least in the lower half, is very good, and that, taken with the slinky curves and just-right gradient, makes this descent one of the best in the entire North Bay region. If you like descending, this one is a must. At mile 13.5, the route arrives at the Jimtown Store. This is a regular stopping place for cyclists in the wine country, with benches in front for basking in the sun and a water spigot for filling bottles up the alley at the side. Inside is an intriguing store, combining antiques, goofy gag gifts, and real general store merchandise under one handsomely restored roof. Best of all, there is an excellent deli-style lunch counter with a changing menu of delicious cuisine. After a break at the market, continue on 128, but only to the next stop sign. Here, 128 turns right and heads north, but this route is going straight ahead, onto Alexander Valley Road (which looks and feels and rides pretty much like the preceding miles on 128). AV Road crosses the Russian River and after two miles turn rights onto Lytton Station Road, then right again on Lytton Springs Road, under Hwy 101, and up a little hill. Once up the hill, Lytton Springs heads west across a flattish plateau, past Healdsburg’s small airport, and then follows a slinky little descent to a junction with Dry Creek Road. Turn north on Dry Creek Road for a bit less than a mile to a junction with Lambert Bridge Road. That little climb and descent on Lytton Springs has delivered us from Alexander Valley to neighboring Dry Creek Valley. Now, near Lambert Bridge, we are in the heart of the valley, another prestigious and scenic (and bike-friendly) wine region. There is an old store with a new deli at the corner here, and if you didn’t stop at Jimtown, this is the only other spot for store-bought chow around the whole loop. Our route takes Lambert Bridge and crosses Dry Creek: a pretty old bridge over a pretty stretch of creek. At its far end, this little road tees into West Dry Creek Road, where we turn left and head south. Both Dry Creek Road and West Dry Creek run north and south, one on each side of the valley. Dry Creek is smoother, wider, and busier. It carries all the traffic to and from Lake Sonoma, a large recreational destination up at the end of the valley. 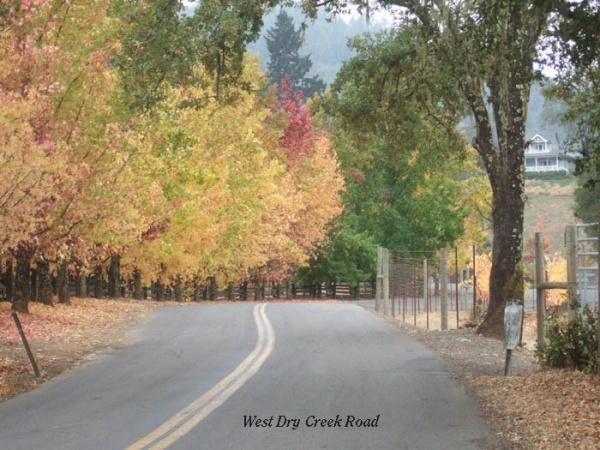 West Dry Creek is the preferred cycling road. It is narrow and winding, has slightly lumpy pavement, is forever dancing up and down over an endless series of little hills, and carries almost no traffic. What it does carry are legions of cyclists. This is quite possibly the most popular cycling road in the area...perhaps one of the most popular in the state. It’s the sort of road that you would create, were you to sit down and try to design the perfect back road cycling experience. As a consequence, it is featured in the catalogs of every company that runs catered cycling vacations. It is used for at least two centuries (including our club’s Wine Country Century), for triathlons, for road races, and for several other mass rides. Plus of course, it plays host to an endless succession of weekend club rides and visits from individuals out for a spin among the vines. The only problem with all this cycling perfection is that the constant glut of riders—often dawdling along two or three abreast—has caused some of the local residents to become a bit fed up with all the riders cluttering up their road. Our club has been working hard in recent years to find some rapport with the folks along this road, and the results have been gratifying. We are figuring out how to share the road. While we vigorously defend our right to ride on any public road—especially one so ideal for cycling—we are sympathetic to the complaints of the residents and motorists, and we try hard to educate riders to be sensitive to the world around them: to ride single-file, or, if you must ride double, to stay alert for overtaking vehicles and to single up promptly as needed. West Dry Creek tumbles along its up-and-down course for five miles down the narrow valley. For the most part, the valley floor to the left is all vineyards, while on the right, the steep hills are covered in dense fir and oak forest. At mile 26.5, this delightful road tees into Westside Road. Westside is almost as nice as West Dry Creek. The scenery is every bit as good and the road is perfect for cycling—more pleasantly diverting little ups and downs through the trees and vines—and the only marks against it are a slight increase in traffic and one section with lousy pavement. We’ll be on Westside for another nine miles. Midway along the road, we pass through the Sweetwater Springs Historic District, a wide spot in the road highlighted by the grand old hop kiln at Hop Kiln Winery. Hearty, dark hops used to be a major crop in Sonoma County before Prohibition and big, bland, brand-name beers wiped out the little brewers. There are numerous old hop-drying barns in the area, and this stately stone structure is one of the finest examples. There is one fairly ambitious climb toward the end of Westside: up about 100’ in half a mile through a shady wood. The pretty little valley that wanders off to the west halfway up the hill used to belong to actor Fred MacMurray, who kept a prize herd of Angus beef here. After his death, the property was acquired by the omnivorous Gallo family, who have turned it into yet another vineyard. (Fred’s daughter Kay still lives on the property and is fully engaged in the new world of wine production.) Once on the downhill side of this little ridge, be alert for a left turn onto Wohler Road. Wohler crosses the Russian River on a rusty old truss bridge and then descends to a junction with Eastside Road. Our route turns left on Eastside and climbs gently to a right turn onto Trenton-Healdsburg Road and almost immediately left onto Mark West Station Road. Mark West Station begins with a small downhill through a thick forest, then breaks out into the pastures surrounding a large dairy operation. After two small climbs, the road levels out and connects to Windsor Road, just along the western perimeter of the Sonoma County Airport (the backside of the airport). Windsor Road skirts the airport on a rolling run of a mile and a half. Then we turn right (east) on our last road of the day: Shiloh Road. Shiloh begins out in the country but soon enters that zone of development spreading out from the Hwy 101 corridor. Over the course of two flat, straight miles, it passes a golf course, a time-share condo complex, a WalMart and a Home Depot and all their associated little satellite stores. It also crosses over the freeway. It sounds dismal, but is actually not all that bad, and in any event is soon over. And so too is this ride, as Shiloh road returns us to Esposti Park.